Don't let the title fool you. This is not some new take on the zombie genre or some farcical take on vegans. 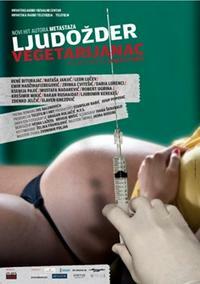 It's another sick film out of Serbia, and after seeing A Serbian Film I was so damaged, I'm afraid to watch this. It's like film is an outlet of catharsis for some gross and disgusting injustice perpetrated on the entire country. Dr Danko Babic (Rene Bitorajac) is a successful gynecologist in his mid-30s. Although clearly an expert in his field, he is an unscrupulously ambitious and utterly despicable person. Babic's best friend is chief police inspector Ilija (Leon Lucev), with whom he takes part in sport-betting scams, and who leads him to 'controversial businessman' Jedinko (Emir Hadzihafizbegovic). Jedinko deals in hard drugs and high-end prostitution (naturally, with police support), and needs a gynecologist to take care of his 'employees', meaning doing illegal abortions for the pros. It all represents government, organized crime and corruption working hand-in-hand, typical of Croatian society. I don't want to sound like some pollyanna but christ- can someone make an uplifting movie? Like walter Brennan said in Capra's Meet John Doe 'I know the woelds been shaved by a dunken barber- I don't want to read about it.' Don't get me wrong, I love fucked up movies, but there's a big differnce between Human Centipede and A Serbian Film. If we do get a positve film it's so insipid that it's unwatchable. Come on indie-ana- give us something happy with substance. I concur with Chuck, what the Hell happened to us? I know GenX is now in the creative driver's seat and as is par for the course with my fellow navel-gazing losers, its all just sad and stupid. The spectrum is derivitive to sick. Is this the group that was weened on Back to the Future and Gremlins? The film is from Croatia, not Serbia. Based on a book by Ivo Balenovi&Auml;&Dagger;. Yea, give us more remakes like Carrie! I've only just finished watching it, and it was actually really good but the ending just ruined the whole thing. It IS nothing like A Serbian Film and it's not even from Serbia. Everyone's overreacting.